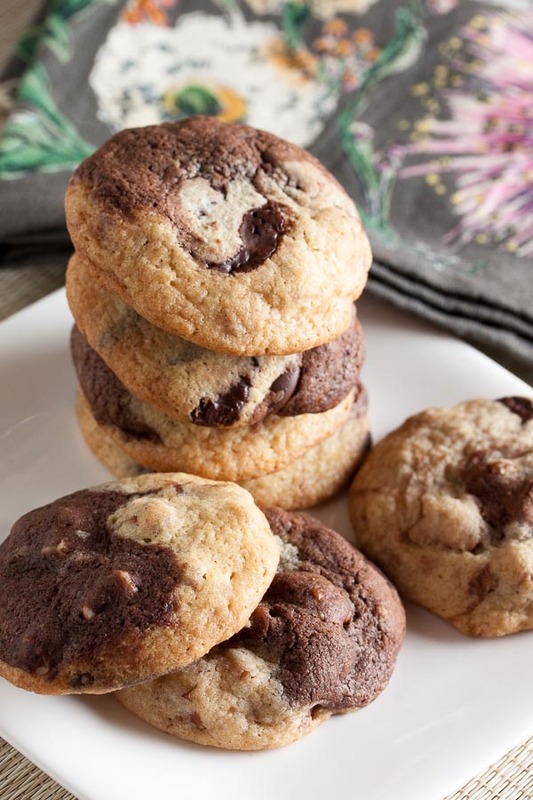 Chocolate Chunk Marble Cookies | wanna come with? I’ve been thinking about making whoopie pies for awhile now – that particular recipe book has been sitting on my coffee table for weeks, all ready to go. Don’t too excited, though. While I almost made them this weekend, at the last minute I was like “meh, that’s not really what I feel like”. 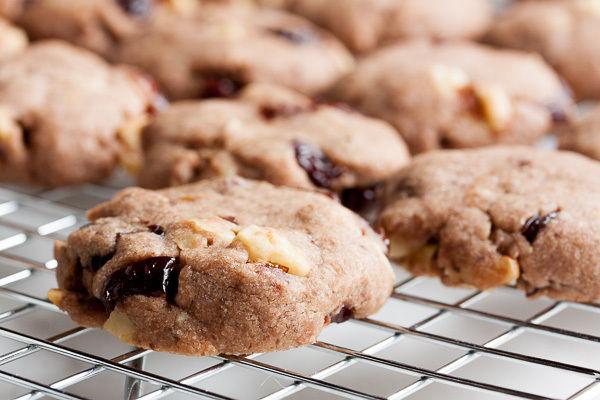 I wanted a good old-fashioned cookie with chunks of chocolate and nuts. 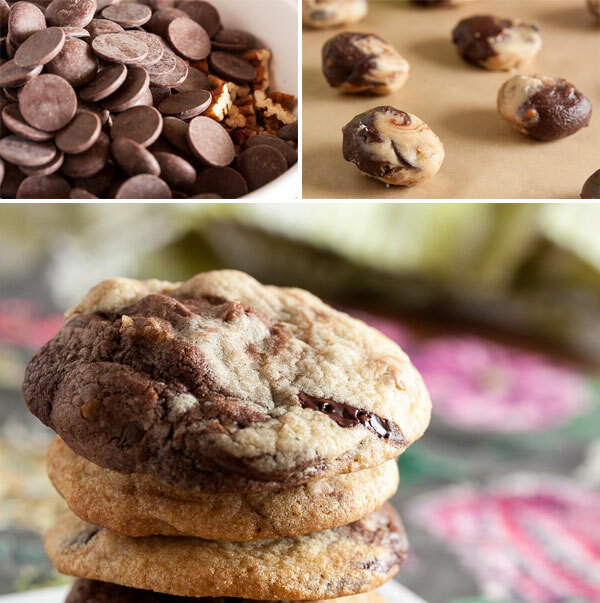 I have no shortage of such recipes and I don’t think I’ll ever get tired of a good, basic chocolate chip cookie, but I also wanted to do something a liiiiitle bit different. Like the cinnamon pinwheel cookies I finally made awhile ago, this is a cookie I’ve seen photos of many times but have never gotten around to trying myself. Why? I have absolutely no idea. There’s no excuse for not making these. 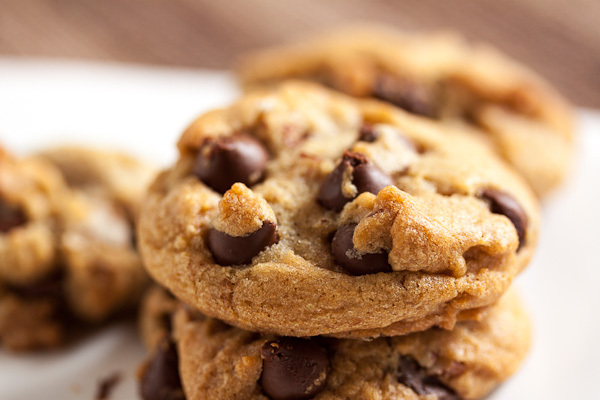 Just one extra step (okay, maybe two steps) takes a perfectly good cookie and makes it so much better. 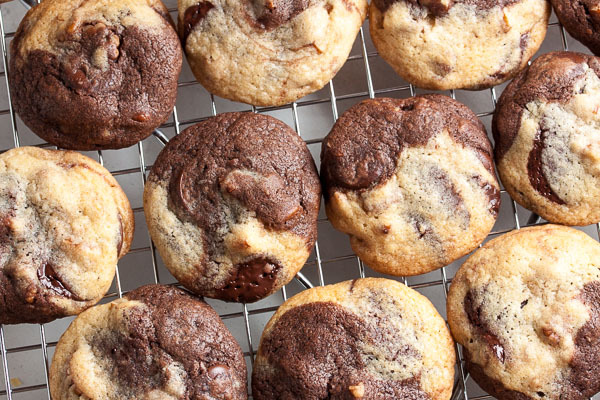 All you need to do is divide the dough in half, add chocolate to one half, and then combine the two doughs back together when you roll the balls. That’s IT. So easy. And yet everyone was so impressed and thought I went to great lengths to make these awesome cookies. I totally let them believe that. And these are awesome cookies. They have a lovely soft texture and great flavour, with just the right amount of crunch from the pecans. 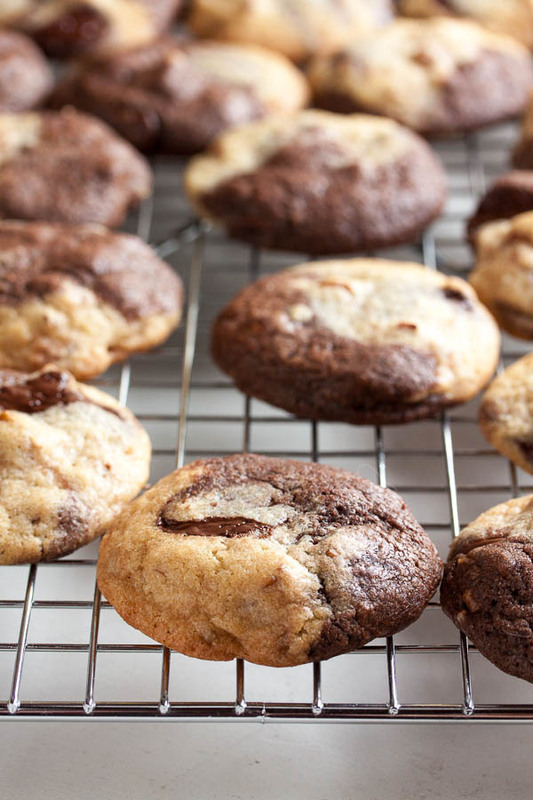 These half and half cookies are not to be confused with the black and white cookies as made famous by Seinfeld, though. That’s another one on my list to try, but that one is black and white in icing only. This one? This is actually half vanilla and half chocolate. And all delicious. Adapted from The Good Cookie by Tish Boyle. The recipe says it makes about 60 cookies. I totally forgot to make note of how many I got – sorry! Turn the mixer down to low and add the flour mixture, mixing until just barely combined. Turn the mixer off and divide the dough in half, transferring one portion to a different bowl. Set aside. Add the cocoa powder to the dough still remaining in the mixer bowl and mix until combined. 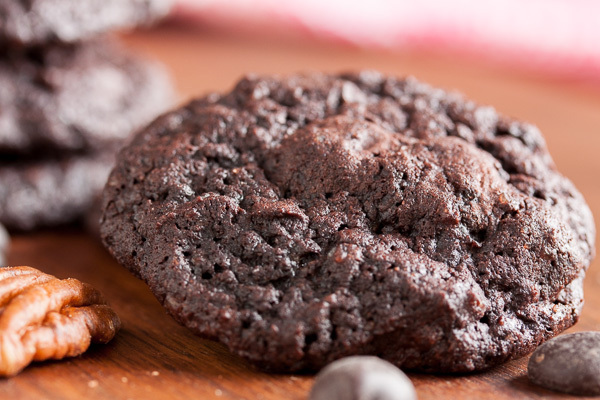 Divide the chocolate chunks and pecans equally between the two doughs and mix in either with a spatula or by hand. I prefer to knead inclusions in by hand to ensure they're distributed evenly. Break off small equal-sized portions of each dough and press together – you'll want about a tablespoon of dough all together. Roll the dough into a small ball. Try not to let the two colours smoosh together too much. Place the dough balls about 2" apart on a baking sheet – these cookies will spread out as they bake. Press the balls down slightly with the palm of your hand. Bake for about 8-10 minutes, rotating the pan halfway through the baking time, until the lighter dough has just begun to turn golden brown around the edges.